On a winter’s day in a British town, twelve-year old Alex receives a package in the mail: an old tin robot from his grandfather. “This one is special,” says the enclosed note, and when strange events start occurring around him, Alex suspects this small toy is more than special; it might be deadly. Right as things get out of hand, Alex’s grandfather arrives, pulling him away from an attack—and his otherwise humdrum world of friends, bullies, and homework—and into the macabre magic of an ancient family feud. Together, the duo flees across snowy Europe, unraveling the riddle of the little robot while trying to outwit relentless assassins of the human and mechanical kind. 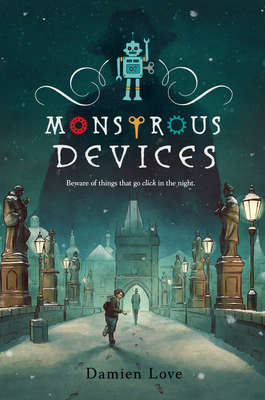 With an ever-present admiration for the hidden mysteries of our world, Monstrous Devices plunges readers into a gripping adventure that’s sure to surprise. Damien Love was born in Scotland and lives in the city of Glasgow, where, even as you read these words, it is raining. He has worked as a journalist for many years, writing about movies, music, TV, and other things for a variety of publications. He has the ability to talk to cats, but there is no evidence that they understand him. Monstrous Devices is his first novel. Learn more at damienlove.com.